Fair Winds Press, 9781592337255, 176pp. The ultimate guide to protein-packed, nut-filled vegan recipes! If you think nuts are just for snacking, get ready to have your world rocked! One of the most nutritious, protein-packed staples of a plant-based diet, nuts can be used in limitless ways to create satisfying meals full of hearty flavor. From main courses, to snacks and drinks, to desserts and cheeses, nuts are used as the main building block of so many delicious vegan recipes. 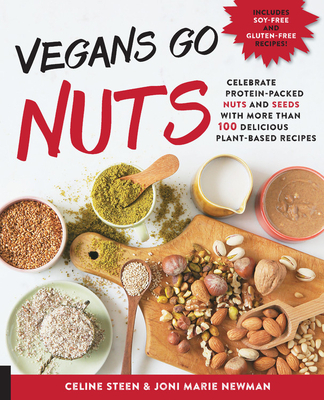 Vegans Go Nuts explores the many ways to cook and bake with nuts, using only vegan ingredients. From the usual suspects such as cashews and peanuts, to more underrated nuts and seeds like hemp and hazelnuts, you'll start by learning to make the essentials - nut and seed milks, butters, and flours. Accomplished authors Celine Steen and Joni Newman will show you just how versatile this staple food can be in your plant-based diet. Make nuts the inspiration of your meal, instead of just an afterthought, with Vegans Go Nuts!